Double-sided adhesive tab for mounting and securing objects. Reuse again and again on smooth surfaces. Use instead of magnets, tacks and putties. 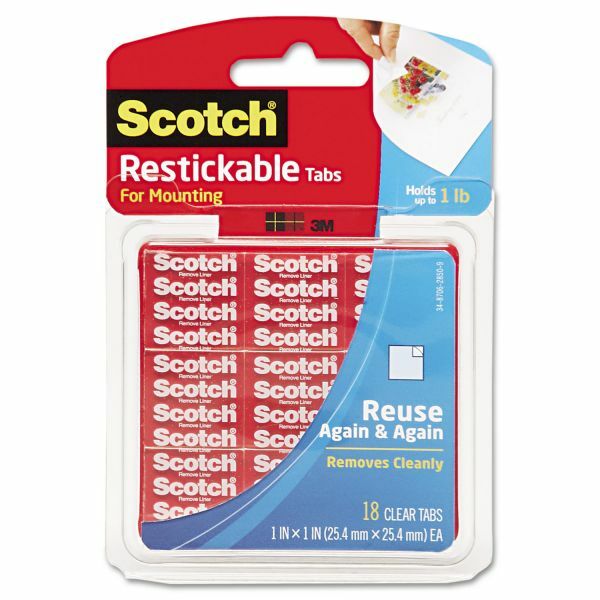 Scotch Restickable Mounting Tabs, 1" x 1", 18/Pack - Scotch Reusable Tabs are designed for lightweight mounting. 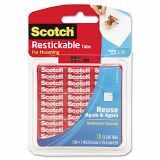 Removable adhesive allows you to reuse it again and again. Simply peel the liner on both sides. Audible snap indicates they are closed. 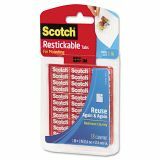 Use these pre-cut squares of clear adhesive to mount photos, posters, artwork or papers on walls, office cabinets, refrigerators, windows, and more. Photo-safe tabs remove cleanly and are UV-resistant and moisture-resistant. Tabs will not stain walls like some putties do. Each inch of product holds 2 lb. with an 8 lb. maximum. Great for hanging and securing artwork, photos, cards and other lightweight items.